Re: Net Gain: Build 0.5.0 available! Ok, so i uninstalled the net gain from where i had it installed and just let desura install the game it self with out telling it where to install it. Game still doesnt launch from desura but i can still run the main exe to get the game to run. Seems somethings changed i changed my cell from 4 to 3 and went on a mission nothing went wrong during that mission but i will attempt to keep on attacking things and see how far i can get. with the cell that i had i had won a mission, failed the second all 3 members dead. So i higher new cell of 3 people and i cant seem to higher anymore members so i try and attack the mob i just failed at with new members i too have a destroyed (removed logs [interrupted]) screen under start operation + my cell group listed. but cant start the spin. -Playing on the road on a touch pad on my laptop really made me want the windows to recognize the up/down arrows for scrolling. Was painful trying to grab the slider bars on a touch pad. -Are corp logos mutually exclusive? Based on the example PNG, you could potentially end up with some very identical corp logos. Trademark infringement and what not Does it do any checking to see if x component is already used in one of the existing logos? -There's a personality trait that shows up as "F"
-The new (non-functional) buttons under the corp menu have me pretty excited. -The new intel system is pretty awesome, works like a charm. Are the nature of associations purely hierarchical? As in, can uncovering the associations of an operative only yield a new operative intel point, and not an asset or company or location? What's the value of a location intel point, for example, other than as a way to associate to other intel points? And apologies if you've already covered this once before, but will all the corp info under the Corps button eventually be hidden away? When you can target the exact corp, company and asset you need to move against, it kind of makes intel gathering against it feel like a time waster. I get that you still need more hands on information and access so you can directly target it...but it'd be more effective to see none of that information and have to dig for all of it. -I feel like maybe having a circle for each profession might be too much. I think you could thematically combine a lot of circles, or make some overlap, so the player has fewer to pay attention to, and also has alternatives if their relationship sours. It would also open up room to maybe semi-randomize the ones they initially offer, or let you scout. -The financials still don't make a lot of sense and fluctuate a lot, but that's to be expected until the economy gets its pass. Will post more when I put some more time in. I managed to play for quite a bit yesterday evening, and managed to avoid getting all my cell members killed this time round, which helped me avoid the 'mission not starting' bug. I havent tryed doing new missions but i still think the game is looping when you get into a fight and all your men die from that, there isnt a win, once you end up in a fight you die. thats a little upsetting but i think its just the routine thats running in game atm. Not sure about that - when my previous cell got killed, I was watching the fight pretty closely. The enemy cell members were losing statistics every so often (e.g. if they failed a dodge challenge), it's just that they were better than my guys and so wore them down over time. I'm fairly confident that, had my guys been good enough, they could have killed the enemy team. I presume the mission could then have continued. Haven't got into a fight that I've won yet, though - it's a difficult case to set up to test! Agreed - I've noticed a few oddities around things that are destroyed or otherwise 'dereferenced'. If you destroy an enemy asset, it still comes up in your mission target list, if it was ever on there. I suspect this also happens if an asset 'expires' naturally by having all its profit used up - if you ever had intel on it (and it was therefore in your mission target list), it will remain there as an entry (which is listed simply as something like 'None'). In a longer playthrough (like I had yesterday) this can get a bit confusing, as your mission target list ends up being a spate of 'None's with some valid targets thrown in, depending on the intel you're holding. -The new intel system is pretty awesome, works like a charm. Are the nature of associations purely hierarchical? As in, can uncovering the associations of an operative only yield a new operative intel point, and not an asset or company or location? What's the value of a location intel point, for example, other than as a way to associate to other intel points? I uncovered an Operative in a corp. Translating the corp-level info into operative-level info, and uncovering associations on that operative, led me to his Cell (or Squad, can't recall). Translating corp-and-operative-level info into squad-level info, and uncovering ITS associations, gave me a location (an HQ). In another instance, I got the HQ location just by uncovering a corp's associations. So it looks like you can navigate all around the tree in various ways - up, down, sideways, whatever. I, too, found this great fun. And apologies if you've already covered this once before, but will all the corp info under the Corps button eventually be hidden away? When you can target the exact corp, company and asset you need to move against, it kind of makes intel gathering against it feel like a time waster. I get that you still need more hands on information and access so you can directly target it...but it'd be more effective to see none of that information and have to dig for all of it. More shortcutting in general would be good to see in future iterations of the user interface - if I've got intel on an asset (or on anything), I'd like a single-click method to get to e.g. the corp/company page where it's listed, rather than having to remember its name, click out to the Corp page, navigate down to the Company, etc. That's a nice-to-have, but it's a very nice-to-have. It's a dystopian future where megacorporations rule with iron fists in a velvet gloves. I just assumed that the financials not making sense was all Part Of The(ir) Plan. At present, most Things (for ease of nomenclature) seem to be linked to most other Things. For example, a corp is linked to operatives, cells, squads, locations, assets, etc. An operative is linked to its corp, its cell, its squad, its location, and maybe assets at that location? The point: currently, I find it difficult to see much motivation (other than testing it out) for putting intel points into anything other than the corp. If I want to find an asset, I research the corp's associations until I find it. I've found one operative and want to find their fellow operative? Well, I could translate all my corp intel into intel on that operative, and then burn it to uncover their associations...or I could just burn it at the corp level, as they'll turn up eventually anyway that way, and the intel won't degrade over time if I keep it at corp level. A possible (not deeply thought-out) suggestion: sever some of those links. Maybe vary them over time. Maybe you can't uncover an Asset by burning corp-level intel - maybe you need to uncover a Location first, and the Assets at that location are only discoverable by burning intel at that level. You want to find a specific operative? You can try to uncover a Cell by burning corp-level intel, and then drill down to Squad and finally Operative level...or maybe you can uncover a Location, and luck out by finding that the operative you're after is based there. An alternative would be to shift the motivation - make it easier to uncover an operative's associations than it is to uncover a corp's associations, even if they lead to the same thing. Make the paths more equal (or perhaps less equal) in cost, as it were. If it's more intel-efficient, but less time/cost-efficient, to uncover an operative's cellmates by directly researching him rather than researching his corp, for example, then that sets up a nice dilemma for the player and makes your 'intel pathway' an active choice, rather than "keep clicking the corp's 'uncover associations' button until I find the one thing I'm after". As I say, I haven't thought through the ramifications of this - just found myself falling into that latter mindset after a while of playing. The same will apply to assets. While they won't move around, their profiting % I assume will change and fresh intel is what will let you stay current on it. There are definitely a number of ways to make this mechanic better, and I'm sure something is already in the mind of the developers. Just to keep riffing on it... the tree could stay the way it is, but the *amount* of intel you get could differ... so, for example, following one operative when s/he goes to meet another could garner far more data on the second operative than trying to dig through personnel records at the corporate level. Another possibility that I don't think is in yet, but I suspect will go in one day, is varying the risk/reward. So, if you can do a deep dive into a corp's mainframe, you can get lots of intel, but you're probably going to have to best an army of guards and a mountain of countermeasures to do it. On the other hand, just following around one operative of the corp is probably a way safer plan, as would be trying to pull the scraps of data you can get from some backwater part of the corp... and, certainly, the corp is going to protect itself better than it'll protect its companies, so the tasks to investigate them should be incrementally easier... you get the picture, I'm sure. I cant launch though desura, and i can not launch though client. 31 meg something ?. im going to delete completely and try again but i hold no hope till newer patch for fix sorry. Just saying, i actually managed to recover it my self via desura but its confusing as hell to do. reinstalling. Failed to start, It actually came back up with do you agree with statement, i said yes, and pressed play and it just closes . Hey! The forums are usually so quiet, I hadn't noticed people were posting in here! Don't use the old direct download links anymore. Those versions are old and always will be. Desura has been giving me guff the last builds as well. it SHOULD be done from here on out, though this latest build might also give problems (5.1). this is an issue I'm resolving with the desura client. Best best is to go in the desura folder and delete the game, then reinstall. running from the EXE also helps. Hopefully we wont see that bug from 5.2 going forward. That bug with "dan"'s skill check being 6-5 is definitely a bug. I dont suppose you know what ranks he had in the related skill/school, or what his Acuity was? Aaaaah balls, yeah. this is that same "same name" bug, I'll have this fixed soon. I'll just change the name for now, ans a deeper fix would require ripping up some stuff for a very specific one-off issue that'll be resolve once the skillsets get their next iteration. The thing with missions not starting is because squads within cells were getting stuck in "destroyed" state when all the operatives are gone. this has been fixed in 5.1. Intel is a first pass system, so it'll definitely keep growing. there isn't a heirarchy (yet), but the associations are specific and different. Yesa, corp intel can get you most things about that corp, but a. that might not be what you want to know, and b. it has lots of associations you might not care about. Say you want to cripple a rival's operatives. corp associations will pull up operatives, but also all their companies and assets which you might not care about. an operative mostly is associated just with other operatives he knows, so you have a higher chance of uncovering them simply by there being fewer alternatives. risk/reward is all planned, yeah. currently investigations jsut hit the headquarters, but that'll change to you seeing different options with different payouts. corps are linked to lots of things, but that massive selection is a good start but not the easiest to get something specific. As long as you have intel on something you'll have a live feed (spies/informants/hidden microphones or cameras in place) of that item. Intel will degrade over time as you lose your leads on that item, and once intel is gone you lose that link. That said, yeah the system definitely needs more work and is still growing, but your feedback is still helping me get a picture on what you are expecting to be enabled to do! The tree of associations will get more complex and "Gated" as more elements join those connections. for example, I'll be making it so you must have intel on the company to uncover intel on the associated assets. Ideally, in the end the system should by a flowchart/web of links, with each node giving you "suggestions" for what sort of associations you can pull from it, and you can choose to hunt for those specific things, letting you guide the process a bit more and letting you make those "know a guy who knows a guy" scenarios, pathing up to your desired target by compromising your target's network. I'll put in a temporary "static response team" soon, so teams might have a better (but hopefully not overpowering) chance of surviving conflicts. Conflicts do work, but the responding team is perfectly suited to the challenge which means most teams are brutally massacred if caught. Of course, a good team doesn't GET caught... your team *will* now always fight with their best person for the available attack, but it's still an uphill slog. this is still all temporary until the full conflict system, where everyone can help out (if you're familiar with Spirit of the Century, it'll sorta play out like that). I'm sure there are a lot of "dereferenced" bugs, given how connected this game is. Please, if you see any, report them on support.levelzerogames.com/bugtracker/ so I can find and fix them! The one you mention is because anything you have intel on shows up there, and intel lasts beyond the expiration of the target. This is actually by design, but the handling of expired targets hasn't been finished properly. Theoretically, that intel should then degrade and fall off your list. Location intel is SPECIFICALLY for finding other intel, no purpose on its own. However the associations may be more important to you. For example, IP on your corp HQ city will uncover any operative in the area, possibly uncovering rivals in your territory. Yeah all the actual data will be hidden behind a "intel amount requirement wall at some point. Given the limited depth of the game at this early stage I preferred to let people see the inner working until those systems are in place. A general design guideline for Net Gain is "don't lock things away until you've made the key". Yeah I want memos to do that too! I'm half through a system to do so, but the menu system I built needs some love to make pathing through different menus work. Once that's in place I can enable those "target for mission" buttons, memo links, etc. have them all open the proper menu tree. yeah the econ is still a bit messy. The bigger change coming in the next pass is a more "fiefdom" style system that will make things more stable, with companies being truly independent and expanding/etc themselves, while paying a chunk of their income up to corporate. Corporate then uses its funds exclusively for getting new corps and paying the broker department budget. controller/hotkey support isn't going to be too soon, but soonish. 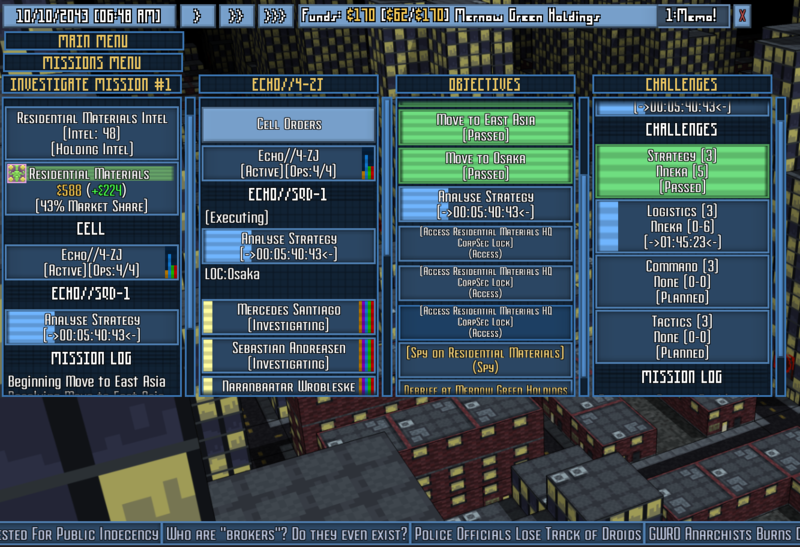 Helps with the RSI I'm planning on tackling it on the next GUI/menu iteration but that might be a while. corp logos are biased towards unique ones, but they can have very similar (or very rarely, identical) logos, have to given the finite/infinite considerations. I've wistfully and (half) jokingly considered that this should enable a new "infringement" mission type against that corp, full of legalese plots and backroom deals that forces the losing corp to change their branding! "F" personality trait? can you get a screenshot of that if you see it again and report it on the tracker? Circles are in a bit of an awkward transitional phase. the idea is there are a few big name ones that you mainly work with, but everyone has multiple associations. so that "techie" circle has a hacker in it, but he's also part of the "hacker' professional circle, and maybe the "Good Luck Club" circle of hacktivists and con men. treat that hacker well and those circles like you more, treat him poorly and they all lose favour: on a scale of the size of the group, so while techies in general won't care much, the Good Luck Club might get pissed if you kill off 1/5th of their circle, maybe enough to throw some heat your way. New news: active obj tracking (the details panel updating to show what the squad is doing), and a new sigma (Σ) character!